Do you know anyone who suffers from dementia, or are you unsure if someone you love might have dementia? This is the article you’ve been looking for! 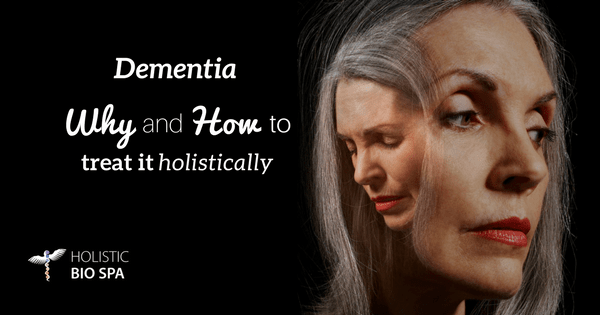 Below, you will learn the definition of dementia, how to diagnose it and what are the best natural treatments for dementia. Dementia is a general category of brain diseases that cause long term inability to think and remember. It affects a person’s daily functioning, and usually also causes emotional problems, decreased motivation and eventual loss in language. Alzheimer’s disease is the most common form of dementia which amounts to 50% to 70% of all cases. Vascular dementia, usually from either multiple strokes or severe atherosclerosis makes up to 25% of cases. Other causes are Lewy body dementia, syphilis, chronic mercury, lead, cadmium, and aluminum exposure, Parkinson’s disease, Creutzfeldt-Jacob disease, hypothyroidism, vitamin B1 deficiency, vitamins B12 and folate deficiencies, MTHFR mutation and others. Diagnosing dementia can be a challenge. Neurologists use cognitive testing, such as asking patients to subtract 3’s from 100, who were the last three U.S. Presidents, the mini mental examination, CT, and MRI scans with and without contrast and SPECT or PET scans. It’s important not to criticize others if you have similar weaknesses yourself. Physicians should ask about present and past mercury exposes such as mercury amalgam fillings, root canals, occupational exposure to chemicals and heavy metals. Laboratory and history testing should include complete blood counts, full metabolic panel including a complete lipid panel, lipoprotein (a), fibrinogen, homocysteine, CRP-HS, complete thyroid hormone tests, DHEA-Sulfate, testosterone, estradiol, estrone, progesterone, FSH in women, afternoon resting oral temperatures, apo E genotype, history of diet colas (aspartame), history of MSG, the person’s diet (ratio of protein to fats to carbohydrates), history of chronic stress, alcohol history, what types of fats they consume and their cooking oils, family history of celiac disease or gluten intolerance, mold exposure, food allergies, smoking history, current or past hypertension, etc. With decades of experience treating patients with alternative and holistic methods, our doctors confidently recommend a personalized version of the above as the best natural treatments for dementia and Alzheimer’s disease. At the Holistic Bio Spa, we have successfully reversed beginning and moderate Alzheimer’s disease with our protocols. It is important that the patient remains with Dr. Kwasniewski’s diet their entire life with intermittent urine fasting according to Armstrong’s protocol. Any deviation of this will bring back dementia. Call us to make your appointment +52 (322) 221 1607 and heal your mind and body with the best natural and holistic treatments for dementia and Alzheimer’s disease. If you at one point hesitated to get treated for dementia with alternative methods, schedule a consultation with our physician Jake Ames, MD, HMD to visualize the results possible with our holistic treatments.